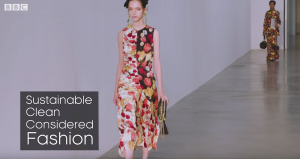 BBC Earth recently published a short video entitled “Can Fashion Be Sustainable?” drawing further needed attention to the harmful influence of fast fashion. The fast fashion industry releases waste and chemicals into our rivers, landfills, oceans and the air we breath. It pollutes environments and drives species to the brink of extinction. BBC Earth asks if there is a solution to being both fashionable and sustainable? The video attempts to give an answer. makes an argument that natures power of regeneration is remarkable and if we can only give it a chance, we may just yet be able to stop the harm we are supporting. It is possible to do so if we can only change our attitude and behaviors by considering our purchases, loving our choices, buying quality and consuming less. MTIX believes in the importance of environmental responsibility. That is why we have designed a disruptive technology platform that can in some cases treat fabric with 94% less chemical resources, 99% less energy consumption, 75% less water used and with 90% less greenhouse gas emissions when compared to current industry standards. We all wear and consume clothes. We all have a part to play. Consider your purchases and the impact they have. Thank you. See our earlier post about the Dangers of Fast Fashion where BBC investigative journalist, Stacey Dooley, reports on the negative impact of Fast Fashion and how in some areas it has had enough impact to cause the 5th largest body of freshwater to almost completely dry up.